The otherwise very useful web site “Skeptical Science” seems to be bent on minimizing estimates of the impacts of land use (and especially livestock agriculture) on climate change. They don’t think that animal or human respiration can possibly contribute to carbon dioxide (CO2) emissions. Oh, really? To me it is fairly obvious that it could contribute to climate change, depending on how much we’ve destroyed the earth’s plant life that removes CO2 through photosynthesis. 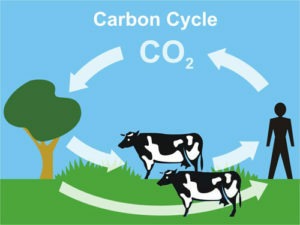 But to “Skeptical Science,” it is equally obvious that cows and people can’t contribute to climate change by respiration. They become rather huffy when a number of people (in the comments section of this page) start to question their thesis. What is going on here? We’ve just put an extra cow into the picture. Thus the CO2 emitted has increased. Now is it in balance? Well, maybe, depending how you interpret it; the graphic is becoming ambiguous. You could argue that photosynthesis must also increase and therefore that Scenario 2 is still in balance. Where is this extra cow going to get food? We have to assume that the human has, through agriculture, created some extra plants for the extra cow to eat — perhaps by growing some extra hay or growing some extra soy and corn for the cow. 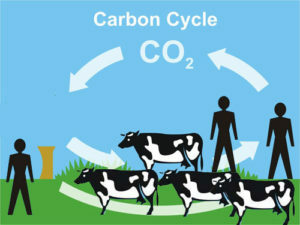 These additional plants, wherever they are, will add to the photosynthesis efforts of the plant world and balance out the respiration of the additional cow. Let’s be generous and assume that Scenario 2 is balance. What if we have a different, more extreme scenario, which is clearly unbalanced? How about Scenario 3, in which we’ve we’ve doubled the cows and tripled the people over Scenario 2? On top of that, we’ve chopped down the tree and burned it, symbolizing that the total quantity of plant matter is not even keeping up — it is actually decreasing. Now, is this in balance? No, clearly not. CO2 is going to accumulate in the atmosphere. Skeptical Science would doubtless agree that in Scenario 3 CO2 has been added, but that it is already been accounted for as “land use change.” After all, land use change is an acceptable category of CO2 emission, currently not thought to be very large. “Land use change,” as used by “Skeptical Science” (and others), does not refer to the fact of imbalance between plants and animals. It refers to the one‑time extra CO2 added to the atmosphere in the process of changing the use of the land. E. g., one year we burn down a forest, and the CO2 from the burning wood is added to the atmosphere. In terms of Scenario 3, it’s the CO2 released when that tree that’s been chopped down is burned. It incorporated carbon, now in the atmosphere as CO2 — and that carbon has been accounted for. But what about next year, when no additional burning or deforestation takes place, but cows are turned loose in the area and the area remains with less vegetation? Haven’t we destabilized the area by introducing an imbalance, with fewer plants and more animals, and won’t this increase CO2 as well? We can now see the problem. There are two different phenomena here, and “Skeptical Science” is talking about only one of them. (2) But there will be another long‑term, chronic problem, the problem of “indirect land use emissions.” There are now fewer plants to metabolize CO2 through photosynthesis, and more animals. This is an imbalance problem. It does not have a specific point source (like a cow or coal-fired power plant). There is no single cause that we can point to and say “that’s the cause, right there.” Because the imbalance problem persists from year to year, it is potentially much more serious than the problem of direct land-use emissions. It’s easy to see why people might think that direct land use emissions constitute the whole story of land use emissions. The biosphere is a very big place. Human agriculture has greatly increased in productivity just in the 20th century; we are growing a lot of extra plants. These extra plants must be photosynthesizing the extra CO2 coming from the explosion of human and livestock populations. Indeed, there must be plants somewhere that feed the extra humans and extra cows, but that the totality of plant matter has increased sufficiently to compensate for the extra CO2 is an empirical claim, and probably false. Humans have done immense damage to the biosphere over the course of the last couple of millennia, with the destruction accelerating just in the 20th century. During the past 2000 years, total plant phytomass has decreased by nearly half — and declined by 17% just in the 20th century. Indeed, the decrease may be even greater. In the meantime, while wild animals face extinction, total biomass of land megafauna (large animals) has increased over seven‑fold in the past 500 years. Most of this is our livestock, by the way, with 5% or less being all that is left of wild mammal megafauna. It seems to be highly likely that in point of fact, we do have a serious imbalance problem due to the decrease in plant matter and the increase in humans and cows. This imbalance will lead to an indirect increase in CO2 emissions. Eventually, this will also result in extinctions of all the wild animals that depend on this plant matter, and possible food shortages for humans. In this light, it appears to me that land use — defined as the sum of both the direct and indirect land use emissions of CO2 — is a key driver of climate change. We need to be trying to estimate its significance, rather than simply retreating into denial of the problem. None of this implies that direct CO2 emissions from fossil fuels are any less of a problem than we previously thought. Quite the contrary. Rather, the sum total of land-use emissions is an additional source of net CO2 emissions that we had not considered. The situation is much worse than we have been led to believe. Thanks for making these concepts easy to understand. I think the issue may be one of not wanting to say people and their food are the problem. Many on the far left, who remember The Population Bomb book, no longer want to be associated with blaming population for our problems. Socialist literature, being very humanistic, is adamant in emphasizing that humans are NOT the problem, going so far as to argue that genocide could be the outcome of the discussion. Conservatives fear mandatory birth control. And of course nobody outside Vegetarian circles wants to hear that their food (ie: meat) is to blame for environmental problems anymore than they want to hear that their promiscuity could be unhealthy. Yes, no one wants offend their pet constituencies. In the meantime, we’re destroying the planet by just continuing what we’ve been doing. Politeness forbids an appropriate response. Uh, maybe, but calling this “game changing” looks like hype to me. Lots of people are doing stuff and it’s all “game changing.” The article makes it appear that they are looking at the bottom financial line, not the bottom energy line. When it passes all its other tests, I have an additional test: what does this do for the EROEI of the plant? And then if it passes THAT test, the next question is, how much coal do we have left, and how is this any better than getting power from solar, wind, or nuclear? Ok. Thanks. These reports are coming out almost daily now. In fact, there’s a new article out today on Google News about a process of making gas out of air, basically. This is a Harvard professor and researchers backed by Bill Gates. No behavioral changes! They can not tolerate the thought that capitalism has no limitations or that people will have to cut back on animal products and general consumption. But until we start spinning resources out of the ether, we have to look at it like we have limitations. Sad that such breakthroughs will be used against us, to say that we thought the sky was falling “and see how ridiculous these tree huggers are” when in reality none of this research would be going on if not for environmentalists. *correction: they can’t tolerate the thought that capitalism has limitations, that there are limits to growth.